WHEN Gregor Samsa woke up one morning from uneasy dreams, he found himself changed in his bed into a monstrous insect. Such is the iconic opening line of Franz Kafka's Metamorphosis, the novella which has often been described as one of the seminal short fiction works of the 20th century. This dark tale of transformation and aberration has inspired many films, plays, literary works , and even music and video games. A critically acclaimed stage adaptation written in 1969 by actor, writer and director Steven Berkof was put up by the Oral Stage Theatre Company at the Kuala Lumpur Performing Arts Centre recently. Directed by Christopher Jacobs, the production saw Lim Kien Lee, Seng Soo Ming, Joylynn Teh, Dawn Cheong, Lim Soon Heng, Sabera Shaik, Sandee Chew, Hannah Northcott and Amelia Chen give commendable performances. Dark and extremely unsettling, the show was a captivating triumph as it effectively explored themes such as alienation and selfishness, and how humans react to unexpected catastrophes. The production also stayed faithful to Kafka's original work by focusing on the plight of travelling salesman Gregor Samsa, a hardworking if repressed individual who works hard to support his family; his temperamental Father; his emotional yet well-meaning Mother, and sister, the sensitive musical prodigy Greta. One morning, after going to bed feeling ill, Gregor awakes and finds himself turned into a huge insect. This unholy metamorphosis stuns the family, and forces them to drastically alter their lifestyle to adapt to this twist of fate. Will they be able to put up with the disturbing nature and behaviour of their son, now effectively a giant dung beetle? More interestingly, will he be able to put up with them? 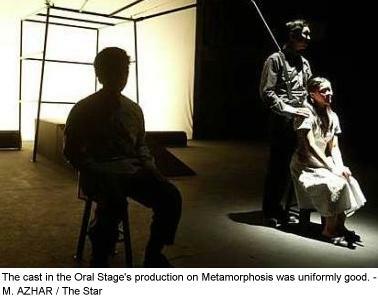 Metamorphosis succeeded in being both entertaining and thought-provoking, raising complex questions that remained with the audience long after it ended. Part of this was a result of the extremely inspired staging: Jacobs successfully utilised every element available to him to emphasise the nightmarish situation Gregor finds himself in, be it light and shadow, stage equipment and props, or chilling background sounds. One of the most efficient devices used was a gigantic metal frame resembling a swing-set that hovered over the stage, which served as a border to demarcate Gregor's room as being separate from the rest of the house. The spindly, spider-like legs of the frame, which reached out to all corners of the stage, invoked images of a giant cage, effectively underscoring how his transformation had trapped the family in an insectile hell. Simultaneously, it also symbolised Gregor's alienation and elevation from the norms of society, beautifully invoked through his being the only character capable of scaling the frame and rising above the rest of his family. The production also featured many absurdist elements: a trio of clockwork-stepping lodgers who speak in a sing-song manner, synchronised eating at breakfast, and a disturbingly cockroach-like chief clerk. These elements enhanced, rather than detracted from, the overall experience of watching this play. Metamorphosis depicted the human tendency to fear what we cannot understand, as well as being a satire on conformity: people prefer dull lives centred on mechanisation and familiarity, no matter how unfulfilled they are. It was also a captivating look at selfishness, effectively illustrated through the Samsa family: despite their son being the victim of this strange plight, they managed to turn the situation to focus mainly about them, and worrying more about how they would to survive and what people would think of them, rather than Gregor's well-being. While the many scenes made this production somewhat draggy towards the end, the passionate performances of the cast ensured there were few dull moments on stage. All the actors did justice to their roles, with even the smallest parts (for example, Sabera Shaik's Char Lady) enhancing the themes of the play. Lim delivered as Gregor, effectively relying not on costume or make-up, but on body language and mannerisms to invoke his transformation. He did justice to this intensely mentally and physically demanding role, invoking an unsettling feeling on all fours with a bug-like demeanour, scaling the metal frame, and even hanging upside down as he delivered impassionate monologues about his plight. While the cast was uniformly good, the standout performer was undoubtedly Dawn Cheong, who perfectly captured the role of conflicted Greta. While being the person who was most sympathetic to Gregor in the beginning, her subsequent breakdown was superbly chilling. The scene in which she convinces the rest of the family to reject him was one of the highlights of theshow. The production succeeded in taking a bizarre plot twist more usually found in horror movies, and elevating it to an absorbing exploration of the horrors within the human soul. It was interesting to ponder, at the end of the Metamorphosis, who was truly transformed into something inhuman. Was it Gregor, with his freakish physical developments? Or his family, who, because of their selfish natures, rejected him?